The following are court results for the Observer area from Hastings Magistrates’ Court for December 13 -15. Rikki Wells (aged 28), of Western Road, Hastings, was fined £130 for failing to comply with the requirements of a community order and attend unpaid work sessions. Tony Bunting (aged 33), of Lower Road, Herstmonceux, pleaded guilty to driving on the A271, Herstmonceux, on September 18 while more than twice over the drink drive limit. He gave a breath alcohol reading of 81 microgrammes. The legal limit is 35mg. He was fined £400 and banned from driving for 21 months. Kevin McHugh (aged 41), of Holmesdale Road, Bexhill, pleaded guilty to driving a large goods vehicle on Bad Munstereifel Road, at Ashford on March 16 last year, which was unlicensed. He was fined £440 and ordered to pay vehicle excise back duty of £55. Jonathan Beck (aged 45), of Camperdown Street, Bexhill, pleaded guilty to using threatening behaviour. The offence took place at Little Common Road, Bexhill, on November 23. He was given a one year conditional discharge. Edward Clough (aged 20), of no fixed address, pleaded guilty to two charges of using threatening behaviour. The offence took place at Priory Meadow, Hastings on November 24. He also pleaded guilty to stealing a bottle of whisky, worth £27, from Marks and Spencers at Hastings on the same date. He admitted being in breach of a two year conditional discharge, imposed by an earlier court for battery and criminal damage. He was fined a total of £160. Jake Cogswell (aged 19), of High Fords, Icklesham, pleaded guilty to being in possession of a quantity of cannabis. He also pleaded guilty to being in possession of three wraps of cocaine and five tablets of the Class A drug MDMA. The offences took place at Old London Road, Hastings, on August 28. He was fined a total of £240. Maria Shepherd (aged 50), of Ellenwhorne Lane, Staplecross, pleaded guilty to driving an MG car at Staplecross, on November 10, while nearly three times over the drink drive limit. She gave a breath alcohol reading of 104 microgrammes. The legal limit is 35mg. She was fined £250 and banned from driving for two years. James Wilson (aged 43), of Reginald Road, Bexhill, pleaded guilty to causing damage, in excess of £1,500 to a motor vehicle belonging to another person. 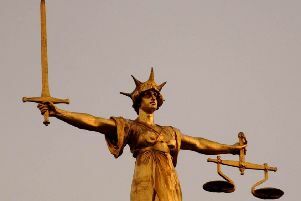 The offence took place at Terminus Road, Bexhill, on November 25. The court made a community order and ordered him to pay £100 in compensation. John Banaghan (aged 47), of Woodland Vale Road, St Leonards, pleaded guilty to causing damage to the front door of a property at Marline Road, St Leonards, on November 23. He was fined £50 and ordered to pay £50 in compensation. Henry Butlin (aged 27), of Mountjoy, Battle pleaded guilty to driving a VW Polo on the A21 at Kent Street, Sedlescombe, on November 29 without insurance or a licence. He was fined £267 and banned from driving for one year. Margaret Kamau (aged 43), of Kenilworth Road, St Leonards, pleaded guilty to driving a Nissan Primera on the A259 at Marina, St Leonards, on November 27, while over the drink drive limit. She gave a breath alcohol reading of 55 microgrammes. The legal limit is 35mg. She was fined £200 and banned from driving for one year. Karl Lindsay, 18, of Brightling Avenue, Hastings, pleaded guilty to, jointly with another, causing £2,890 damage to two internal doors, French doors, walls and furniture belonging to We Love Property. The offence took place at Brightling Avenue on October 26. The court made a community order with a requirement of 150 hours of unpaid work and ordered him to pay £500 compensation. Stuart Stapley (aged 32), of Cavix Field, Northiam, pleaded guilty to being in possession of 72 grams of cannabis, with intent to supply. The offence took place at Northiam on July 1 last year. He was committed to Lewes Crown Court for sentencing and released on unconditional bail. James Downey (aged 26), of Tram Road, Rye Harbour, pleaded guilty to driving a Volkswagen vehicle on Camber Road, Camber, on November 9 without due care and attention. He also pleaded guilty to driving without insurance. He was fined £440 and his driving record endorsed with six penalty points. Kimane Dunn (aged 30), of Redlands Lane, Robertsbridge, pleaded guilty to stealing three items of perfume, worth £104.97 from TK Maxx at Bexhill Road, St Leonards, on November 30. She was given a one year conditional discharge.